Following a series of leaks, Google has officially unveiled the Nexus 10 on its blog. As rumored, the device will be available in a 16GB model for $399 and a 32GB model for $499. The device can be purchased as of November 13th through the Google Play Store in the U.S., U.K., Australia, France, Germany, Spain, Canada and Japan. The Nexus 10 features a 2560-by-1600 (300ppi) pixel screen, which Google claims is “the highest resolution tablet on the planet” at over 4 million pixels. The battery packs 9 hours of video playback and 500+ hours of standby. Of course, the device is shipping with Android 4.2, comes with 2 GB RAM, a 5 MP back camera, 1.9 MP front camera, Dual-core A15 CPU, Mali T604 GPU, 9000 mAh Lithium polymer battery, NFC, and your usual set of sensors. As shown the teaser image and promo video below, the Nexus 10 is the largest of three products announced today by Google: the Nexus 4, 7 and 10. Nexus 10: Powerful and shareable Nexus 10 is the ultimate tablet for watching movies or reading magazines. We wanted to build a premium entertainment device, so we partnered with Samsung to do just that. Nexus 10 is the highest resolution tablet on the planet at 2560-by-1600 (300ppi), that’s over 4 million pixels right in your hands. It comes with a powerful battery that will get you up to nine hours of video playback and more than 500 hours of standby time. With a set of front-facing stereo speakers, you can watch movies right from your Nexus 10 and they simply sound awesome. 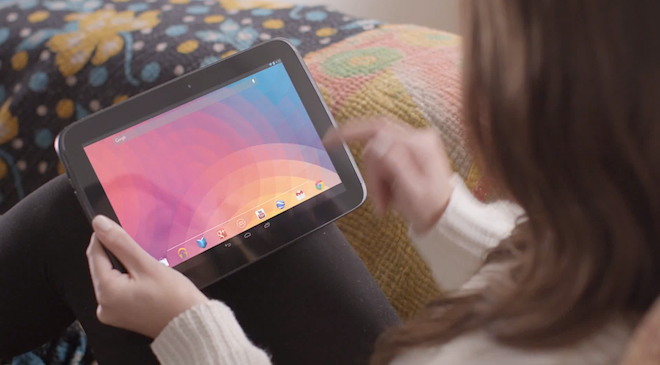 But what makes Nexus 10 unique is that it’s the first truly shareable tablet. With Android 4.2, you can add multiple users and switch between them instantly right from the lockscreen. We believe that everyone should have quick and easy access to their own stuff — email, apps, bookmarks, and more. That way, everyone can have their own home screens, their own music, and even their own high scores. To be notified when the device is available for pre-order, head to Google’s Nexus 10 pre-launch page. You can also read about the newly launched Nexus 4 and 32GB 3G Nexus 7.